Music - You Should Visit Japan! Whether you sing, play or just listen, music is a big part of our lives. So it is in Japan as well. Play an instrument? There are open jam clubs, and live clubs that have open jam nights. Too shy for that? 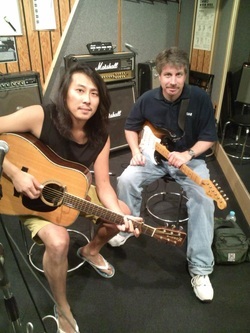 Rental studios (such as the one on the left, being used by myself and my buddy Keiichiro Nemoto) are popular in the larger cities, and you can even rent instruments. Sing? Your karaoke options are practically limitless. Just like to enjoy live music or go dancing? Many options there as well. Jam clubs. Make new friends through the language of music.